Better Subs. Better Wings. Better Days. 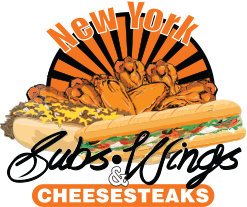 New York Subs And Wings, a division of The Pilgram Group, has been in business since 2015. We are a family owned business that believes in superb customer service and exceptional food. We pride ourselves in classic, rich and robust ingredients which create the perfect blend for all our dishes. Our food truck serves as the hub of our brand serving up the best wings and cheesesteaks Fort Lauderdale has ever seen. Whether it's a family reunion, corporate luncheon or holiday party our food truck can accommodate any event of any size, (did we mention we've catered Jazz in the Gardens in the past?). We're excited to announce that in early 2018 our company is taking our food truck concept and launching a fast casual eatery in Downtown Fort Lauderdale. Aaron Wells has been with New York Subs & Wings for 3 years. Aaron is the Lead Chef for the trailer and the training facilitator for the New York Subs & Wings restaurant (opening in 2018). Aaron is our hometown hero as he donated one of his kidneys to his mother in 2011. Aaron is passionate about his craft and always strives to serve the best food.